Strikingly understated, the 4' Brushed Stainless Steel Gardenfall With Clear Glass Floor Fountain is a combination of stainless steel frame and clear glass panel giving off a look that's clean, contemporary, and sophisticated. The water flowing past polished river rock creates a mood of serenity as it humidifies and cleanses the air, promoting a healthier living environment. 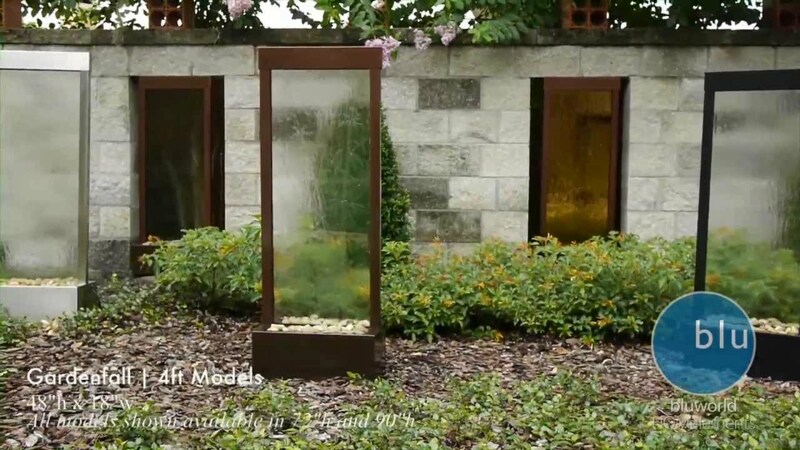 Rated for both indoor and outdoor use, the reservoir can be buried into the ground in the garden to create the effect that the waterfall is growing among the flowers. It can be customized by adding a logo, an image or a personal statement to make it more unique.